Nexba has partnered with Westpac Little Ripper Lifesaver drones, Australia’s highest profile and most successful search and rescue drones. The partnership will see Nexba bring their fight to eradicate diabetes and obesity together with Westpac Little Ripper’s mission to save lives and patrol Australian beaches. Port Macquarie unfortunately saw two young boy’s lives taken during the Christmas period at the hands of the sea. Having the Westpac Little Ripper Lifesaver project in operation can really mean the difference between life and death. 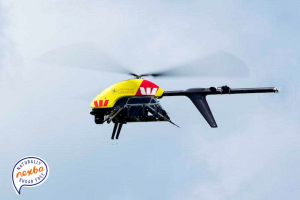 Westpac Little Ripper Lifesaver drones have the ability to rapidly identify and respond to incidents with specialised abilities tailored for search, rescue and lifesaving operations. They operate beach surveillance using the SharkSpotter Algorithm and deploy a marine pod floatation device to swimmers in trouble. Nexba will join hands with the community to fund this Little Ripper drone in Port Macquarie. Every single purchase of a Nexba beverage from Port Macquarie stockists will help towards the funding of the Westpac Little Ripper drone. The range is currently stocked at Coles, Woolworths and Caltex. Nexba co-founder Drew Bilbe said: “This is just the beginning of saving lives”. “In the same way that having a healthy diet can prevent disease, these high-tech drones can prevent tragic incidents occurring on our beloved beaches, which are traditionally a place for fitness, families and fun, and the core epicentre of the Aussie lifestyle,” Mr Bilbe said. Nexba has a history of supporting the community, living out its mantra of being, and supporting, the “naturally brave”. The Port Macquarie launch will be no different and see the Westpac Little Ripper Lifesaver rescue teams expand their resources, paving the way for more advanced drone life-saving operations in the future. “We founded Nexba in 2011 because we had a long-term vision of changing people’s lives and providing a healthy alternative to harmful, sugary soft drinks and/or those packed with artificial nasties. Bringing that ambition to our beaches, our aim is to partner for a Westpac Little Ripper drone on every beach in Australia,” Mr Bilbe said. The launch is set to take place on the 7th April down at Port Macquarie beach where a number of key stakeholders from relevant partners and local businesses will be in attendance, including the Mayor.